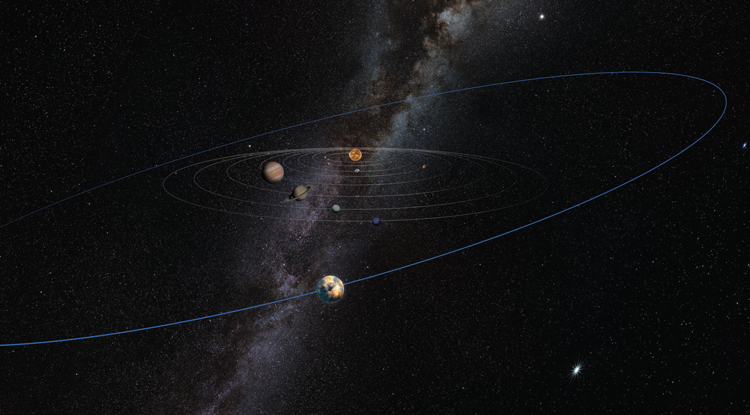 Astronomers are still hunting for evidence of a proposed ninth planet lurking somewhere in the outer reaches of our solar system. But now, in the process, they have something else to search for. New research from the University of Arizona hints that there may be another planet out there, waiting for us to find it. Researchers Kat Volk and Renu Malhotra studied the orbits of objects in the Kuiper Belt, the asteroid field where Pluto is located. Objects in the Kuiper Belt orbit at an incline relative to the rest of the solar system. Typically, unusual orbits like these can be explained by the gravitational influence of nearby planets, but there are no existing planets that could have caused this kind of tilt. One explanation, proposed by the researchers, is that there is another planet out there messing with those Kuiper Belt objects. According to the pair’s calculations, the undiscovered planet would have to be about the same size as Mars. The researchers predict that the mystery planet is around twice as far away from us as Pluto, at 50 to 55 AU. But there’s good reason to be skeptical that this planet exists at all. A planet as large and close as the researchers claim shouldn’t be too difficult to spot, so if it does exist it would be surprising that it was not noticed before now. There are several sky surveys like Pan-STARRS and NEOWISE that should have picked it up. But just because they haven’t seen anything yet doesn’t mean that Planet 10 isn’t out there. It could be particularly hard to spot, dark and non-reflective, or hiding in a region of the sky where we haven’t looked at in detail. If Planet 10 isn’t out there, that means something else is causing the strange orbits of all the objects in the Kuiper Belt, which might be an even bigger mystery. Asteroid Day Is June 30th …We Will Rock You!